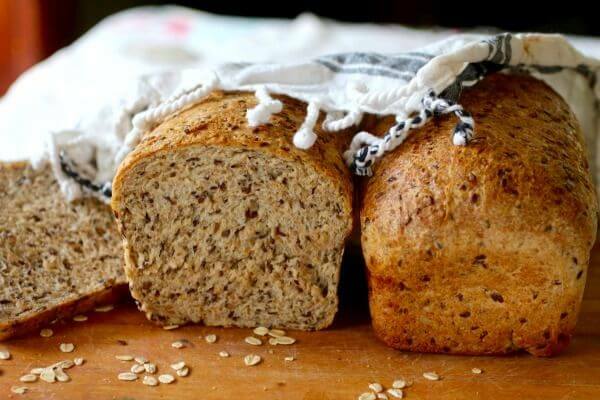 If you are looking for a hearty, healthy multi-grain flaxseed bread that you can make at home here it is. It’s full of healthy ingredients and a generous splash of honey to give it just enough sweetness. It makes a hearty sandwich or the crunchiest toast imaginable. If you’re family prefers white bread you can’t go wrong with this honey buttermilk bread!Originally published May 2007 and updated September 2016. Do you cringe when you see the words healthy and recipe in the same phrase? I admit that I do. Maybe it’s because generally healthy recipe can be translated tastes like cardboard. I promise you this is not the case here. This bread is not coarse or dense. It’s a little chewy with a thin, crisp crust and a wholesome, nutty flavor. 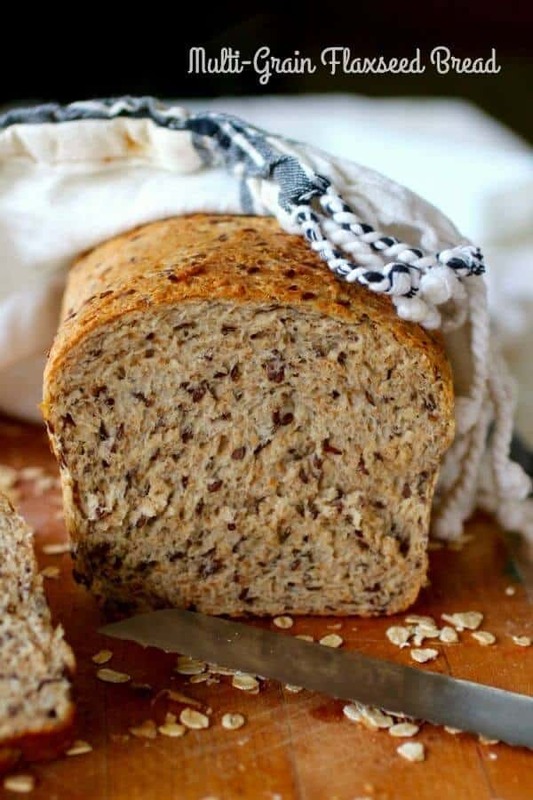 Since there are flax seeds as well as a ton of other good seeds and whole grains this homemade bread recipe is high in omega-3 fatty acids. That’s the stuff that keeps your cholesterol at a healthy level. 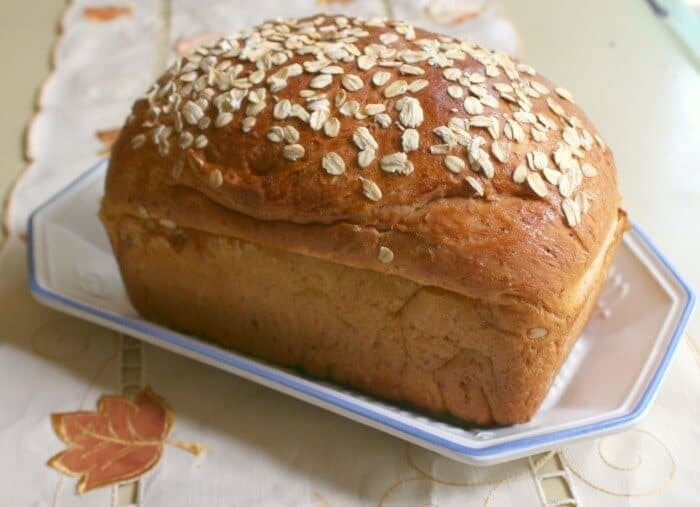 Homemade multi-grain flaxseed bread is delicious toasted and generously smeared with butter or your favorite jam. When this bread is in my house I do not low-carb. It’s impossible. Lock the loaf in a tin breadbox. Have one of my kids (all of them are taller than me…all of them!) put it on the highest pantry shelf. It still calls to me until I drag a chair over, pick the lock, and cut a slice of this wholesome flaxseed bread. I don’t even feel guilty afterwards. Not even a little. Where Are All the Crunchy Moms? 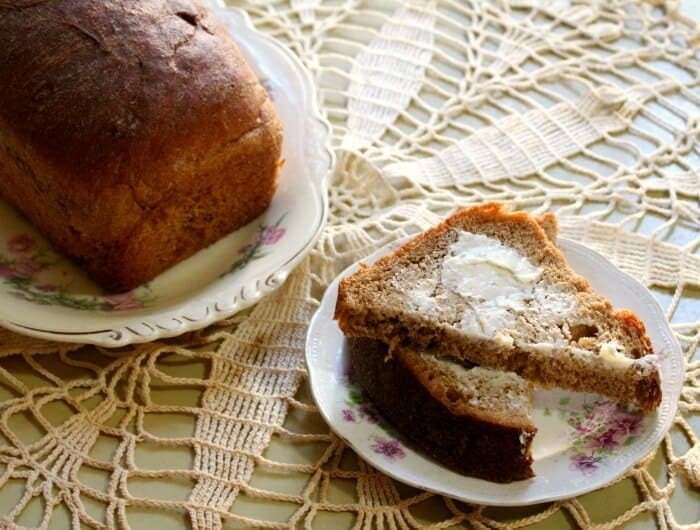 In the late 60’s and early 70’s people rediscovered whole grains and homemade bread. I think it was brought about by the Wonder Bread Generation rebelling against that soft, spongy whiteness. We traded cornflakes for granola, embraced chewy brown rice, and eschewed limp canned vegetables. My parents were way ahead of their time. They were born in 1917 and 1918, teenagers during the Depression. By the time I came along in 1960 they were adept at growing lush, organic gardens in the backyards of the various houses we lived in. Although Dad never did give up his Corn Flakes he fell in love with granola and added it to the breakfast menu. Fresh vegetables were on our table all summer long and in the autumn the kitchen counters were lined with Mason jars. Stewed tomatoes, pickles, pears… The list goes on and on. They had lived through the Depression and they knew the value of being self sufficient even in the midst of prosperity. Until Mom was in her 80’s she’d find pear trees in the neighborhood that weren’t being harvested and ask if she could gather the pears. She’d can them and take a few jars back as a gift to the owner of the tree. She knew where the best wild pecan trees were, too. I’m definitely a product of my parents. Kneading bread can be tough to explain even though it’s so easy to do. Here’s a tutorial that should help! Make this loaf in a round, oval, or any freeform shape. The dough is stiff enough to handle it. I make mine in a bread pan but that’s just a personal thing. You need a good stand mixer for this bread dough. I’ve kneaded it by hand in the past but it takes a long time and strong hands. I use a Bosch. You can probably use your Kitchen Aid since it’s just a little over 2 pounds of dough. This has a longer rising time than most of the breads I make. You’ll need to be patient but it is worth it. Get more bread baking tips here. I put together the sponge for this multi-grain flaxseed bread Sunday before church. I figured it could do the first rise when I was at church and I’d finish it up when I got home. Although I hadn’t tried it this way before it was actually better than the old method. When you make this just leave the sponge to rise for 30 minutes or up to 4 hours. After it has risen stir it down and add the remaining ingredients. Knead the dough for about 5 to 6 minutes by mixer, 15 minutes by hand, and let rise for 90 minutes. You punch that down and shape the loaves, letting them rise for another hour before baking. Be sure to use bread flour. It keeps the bread from being crumbly and falling apart too easily. All purpose flour is not the best choice but will probably work.Do not use cake flour in this recipe. This bread is best if it is allowed to cool before slicing. If you make a lot of bread, especially a lot of whole grain bread, consider getting a Bosch. It can handle up to 6 pounds of whole grain dough and kneads the bread so well that it is light and fluffy. I added gluten to this recipe when I updated. It helps the bread rise high and light. You’ll find more great products for your bread baking adventures in the Restless Chipotle & Co. Storefront! 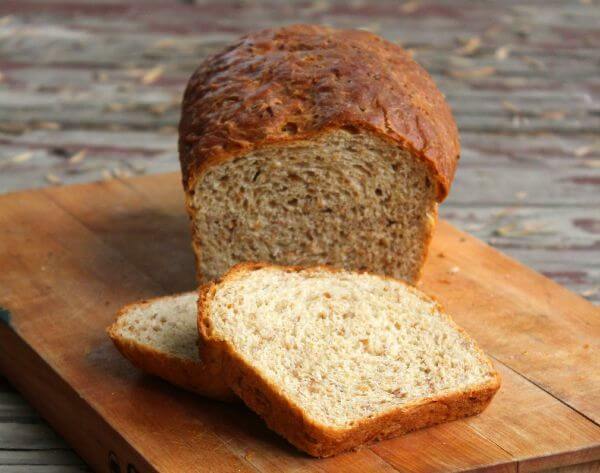 Here’s the flaxseed bread recipe! If you love this hearty homemade bread please give it 5 stars. Also be sure to check out the Harvest Bread with whole grains, nuts, and dried fruit! Cover and set in a warm place to rise – about 30 minutes and up to 3 hours. Stir the dough down and add the salt and butter. Using the dough hook on your mixer beat in the remaining whole wheat flour and enough of the remaining bread flour to make an elastic dough. Cover and place in a warm spot to rise. Let rise until double, about 1 1/2 hours. Form into loaves and place in greased pans. Oil tops and cover, let rise for 1 hour or until doubled. Bake at 375F for 40-45 minutes. Cool completely before slicing! Bread will slice VERY thin when it’s completely cool. From left to right: Buttermilk Honey Whole Wheat Bread, Honey Oatmeal Bread, Old Fashioned Molasses Whole Wheat Bread – Click on the image to see the recipe. Here are some similar recipes from a couple of my favorite bloggers. about 2-1/2 teaspoons I think…. I just use a tablespoon. That’s a beautiful loaf of bread and I can’t wait to try it. The more grains the better! Bread or the whole loaf? What an amazing tutorial on kneading the dough. I’ve always been a little scared of making bread at home because it seems so complicated but you did a great job of explaining that. Thank you! Not sure if i’m up for the challenge of making this recipe without a stand mixer but perhaps I’ll work up to it….it looks soooo good!! I want to try this bread, but I don’t have a stand mixer! Any suggestions of how to make it work? Hello…one question…the recipe calls for 1 cup of flaxseed. Does this mean the actual seeds, the ground seeds, or a flaxseed flour? Thank so much! I am eager to make this! This bread recipe looks awesome! Can I reduce the salt a bit without affecting the chemical reaction ? I was also wondering if this bread is a bit sweet or can it be used for sandwiches? SO good for sandwiches. Sure – reduce the salt if you want to. Wheat gluten? Mine says wheat gluten flour? Is that okay? This bread is amazing! Thank you for posting! I thoroughly enjoyed the ritual of spending the day making it. I followed the recipe and the steps pretty much exactly, and it turned out as a spectacularly delicious treat. I’m going to make it again and again, I’m sure. It baked beautifully, and it sliced like a dream. I’ve gotten nothing but compliments. I can’t wait to explore your blog further and try other recipes. Also, I’ve tried literally dozens of whole grain bread recipes, and none have been as good as this one. Allison, thank you! I am so glad you liked it! It’s definitely one of my favorites. Terrific bread! I use 9 grain instead of 7 grain & a blend of flax, chai & hemp seeds instead of just flax seeds. I mill my own flour and this recipe has replaced the one I have used for years. Super easy to cut when completely cooled, freezes well too. Only one downside, this bread does take over half a day to make. The flax machine bread looks so good but I do all of my bread in a bread machine. Wish this one was. What could I replace the Flax seed with? There really isn’t anything. I’d suggest trying another one of the bread recipes on the blog. I made the multigrain flaxseed bread, and the 1 1/2 Tablespoons of salt ruined it. I think it should read 1 1/2 teaspoons. Nope. That’s correct unless you use a very fine salt. How many loaves does this recipe make? I use 9x4x2 pans. Where is the gluten on the ingredient list? It’s there now. Thanks for bringing it my attention! Your multigrain bread is so delicious looking, sure it taste nice also. If you can’t find it the bread will work anyway but it won’t be as light. Do you think this bread can be made in a bread maker? No I think the dough is much too heavy. Do you ever bake a bad loaf of bread Marye? Every loaf you make is picture perfect, and this one looks especially delicious! LOL! I’ve been baking bread since I was 14 and I am 56 now. I better be good at it! Thank you so much! Oh my gosh, this recipe looks amazing! Thank you! I am kind of addicted to it. This bread looks so yummy and healthy!! Love that your Mom and Dad were so into growing, preserving and cooking their own food. Sounds like you had an amazing childhood surrounded by love and good food! 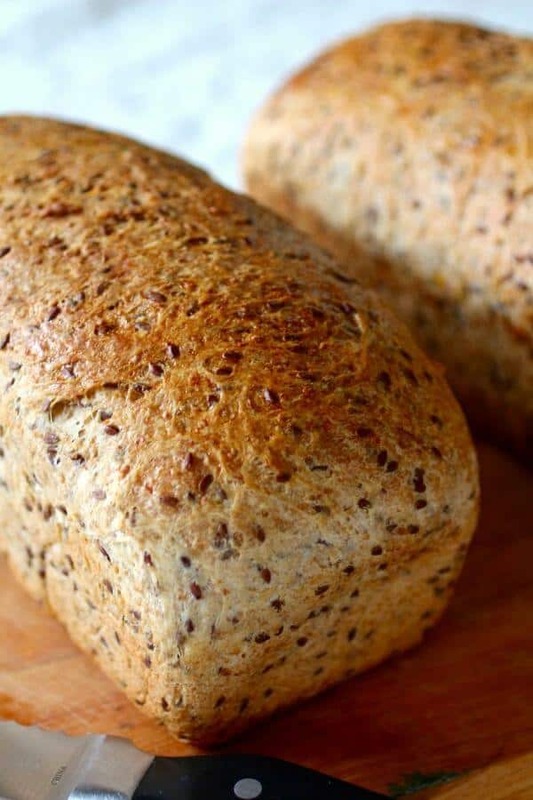 I am trying to make your Multi-Grain with Flaxseed Bread. I am not seeing when to add the 1/4 c. honey. I see about the 1 Tbsp. with the yeast and beginning water, but I am not seeing when to add the additional. I am sorry if I am just overlooking it.